The mission of the Statewide Parcel Map Program is to collect, assemble, maintain, and provide access to statewide tax parcel GIS data. https://gisservices.its.ny.gov/arcgis/rest/services/ or as a data download. GIS tax parcels determined to be owned by the State of New York in all 62 counties. This designation was based on the tax assessment owner name, Internet research, and work with individual State agencies. The State agency that owns and/or operates the tax parcel is also identified. Refinement of this dataset is on-going. Parcel centroid data for all 62 New York State counties. Parcel centroids were generated using the NYS Office of Information Technology Services GIS Program Office's (GPO) Statewide Parcel Map program data. Attribute values were populated using Assessment Roll tabular data the GPO obtained from the NYS Department of Tax and Finance's Office of Real Property Tax Services (ORPTS). 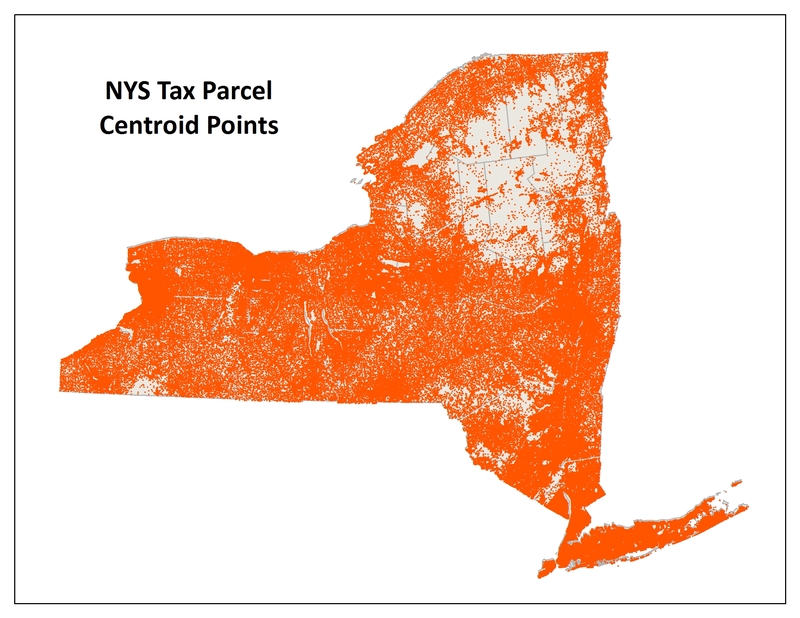 Tax Parcel Centroid Data is available as a web service: https://gisservices.its.ny.gov/arcgis/rest/services/ or as a data download. The Statewide Parcel Map program is the formalization of work that has been going on in New York for more than a decade. As far back as 2004, the NYS Geospatial Advisory Council identified tax parcel boundary and land ownership information as one of three framework data sets necessary for governments to effectively use and benefit from GIS technology. In 2011, the Office of Cyber Security utilized another CAP grant to develop the Business Plan for Centralized Access to Consistent Cadastral Data which identified that at least a dozen NYS agencies undertake independent efforts to gather, standardize and utilize tax parcel data. It also identified "enormous barriers" to gaining universal acceptance of sharing and standardization of the data. In 2014, the NYS GIS Program Office created the Statewide Parcel Map Program and began the work of collecting GIS tax parcel data from counties and incorporating it into a statewide dataset under a common data schema for release to the public. This work is on-going.